The refugee crisis has revealed the limitations of the telecommunications market to offer internet connectivity to people in need. As is often the case when the market fails, citizen organisations have stepped in. 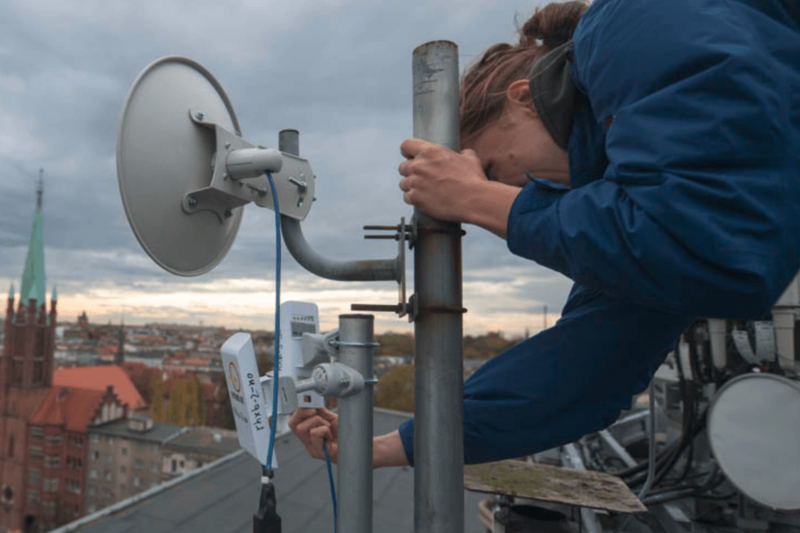 Freifunk.net, one of the most successful such community networks, has come to fill the gap and provide vital internet services to refugees in Germany. This was made possible thanks to an innovative way of using communications technology: DIY networking. Artists have been looking at these networks as a way to expand and diversify our communication abilities, while questioning mainstream access to internet. In this spirit, Mathias Jud and Christoph Wachter recently used the technology to “talk back” to the NSA. DIY community networks have been also used as social tools to reconnect citizens, for example, the Sarantaporo.gr initiative in Greece. Sarantaporo has provided a community solution for affordable internet access, but it’s also a revolutionary model for building networking infrastructure, attracting the attention of academics and institutions. The Spanish community network Guifi.net even won a European Union broadband award last year. These networks have an important role to play as a counter to the few corporations that dominate the internet, and also as a way to raise awareness of the challenges of privacy, net neutrality, censorship, surveillance and manipulation. A wireless router, in essence a special purpose computer, can do more than just connect your devices to the internet. It could host a wide variety of web services, from a simple site to a fully fledged collaborative platform, accessible only to those in physical proximity. These include a virtual announcement board for a block of apartments, an online guestbook for an urban garden, a file-sharing platform for a workshop, and many more creative uses of “self-hosted” web applications, like WordPress, Owncloud and Etherpad that anyone can host on a private web server. These services are accessible through the router’s wireless antenna announcing a network name, a Service Set IDentifier (SSID), exactly as it works when you connect to a free or home wifi. They can appear automatically on a splash page or captive portal when you open you browser (as is often the case in airports, cafes and hotels). If the router is equipped with a second antenna, it can easily connect to a similar router residing in the coverage area whose size depends on the type of antenna and environmental factors. The first antenna can then be used to allow people with their personal devices to connect. And the second to exchange information with the neighbouring router. Each router then becomes a “node” in a small network: anyone who connects to one of them can access the services offered by, and people connected to, the other as well. As more nodes get connected, larger areas are covered, and a community can be formed, initially by the owners of the nodes and eventually by everyone in the area. Of course, you cannot easily build a whole such network by yourself, but you can build yourself a single network node using cheap hardware (such as a Raspberry Pi) and free self-hosted software for installing the set of local services and applications of your choice. The only legal issues appear when you also offer internet connectivity through such a network because of liability issues when it comes to copyrighted content. It is perfectly legal, in principle, to operate such a node on its own, attached to your balcony or inside your backpack. This could be your personal network inviting your neighbours, fellow travellers, or any strangers sharing the same public space. The presence of an invisible digital space can be announced through physical urban interventions: a visible marker on the device itself, a QR code, a poster, even through artistic performances or direct face-to-face communication. Anyone in proximity can join without the need for credentials or other identification, except for being there, and without the need of any internet connection. The ‘occupy here’ DIY network node, developed by Dan Phiffer during the Occupy Wall Street movement in New York. 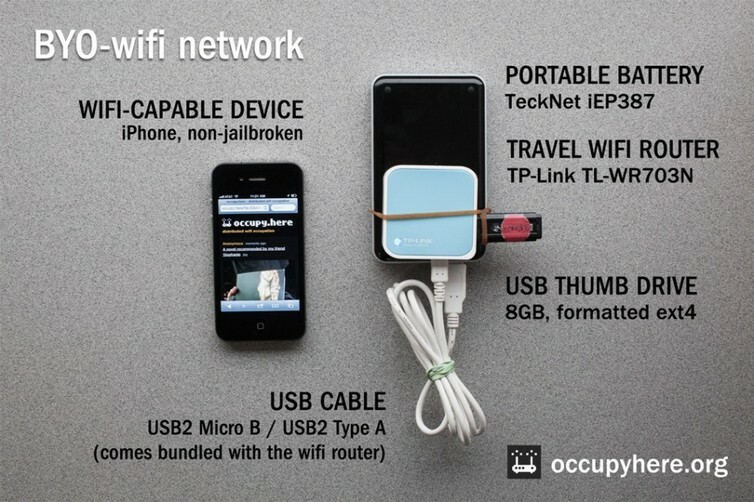 Examples of successful uses of such personal networks include occupy.here or the PirateBox. Polylogue allows people in proximity to post short messages and see them printed live on a piece of paper that as it advances, gets shredded on the other end. A sort of hybrid, real-world Snapchat. Soon it will be possible to build and customise a wide variety of such DIY networks using the MAZI toolkit. 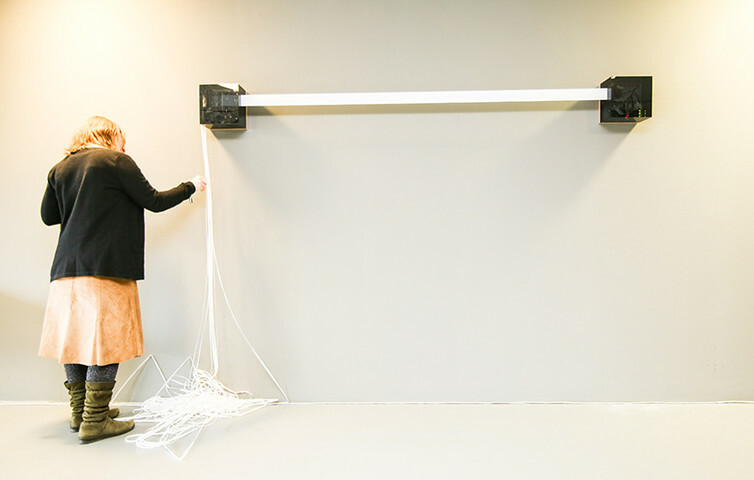 Polylogue I in action, Transmediale Berlin 2016. Community wireless networks have been under development since the late 1990s by tech enthusiasts and activists advocating for a more open, neutral and democratic internet. They include a mix of local services, such as file sharing and live streaming (AWMN.net and Ninux.org) and the provision of internet connectivity. Freifunk, WlanSlovenja, Sarantaporo.gr, and many more focus on this aspect. There are also important differences related to the governance model and the concept of the community itself. Freifunk follows the “free internet for all” approach and depends mostly on voluntary contributions of their members to offer internet connectivity. On the other hand, Guifi.net places significant focus on the concept of the “commons” implying concrete boundaries and resource management rules. It has developed a unique model in which the network infrastructure, including fibre cables, is treated as separate from the services they are involved with providing. A map depicting the nodes of the Guifi.net network in Spain. 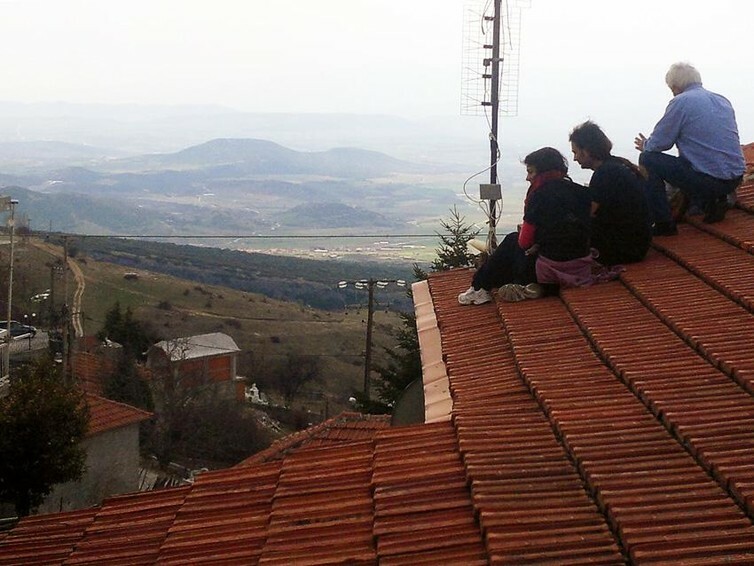 The Sarantaporo.gr Community Network in Greece represents another type of community network, deployed in rural areas with limited or no connectivity – places where the free market fails. This particular network was built initially by a small team of young activists who received hardware by the OpenWifi project of the Greek Free/Open Source Software Society (GFOSS), and funding by the EU project CONFINE and free Internet access via the Technical University of Larissa. It has provided broadband internet to around 15 small villages in Elassona municipality, but most importantly has raised awareness and hope about building communities of commons in Greece. The main concern today is to include more local people in sustaining the network, providing suitable legal, economic, and political tools for ensuring its sustainability, but also shifting the focus beyond internet access and towards possible local services that could be offered over the existing common infrastructure. Antenna installation for the Sarantaporo.gr Community Network. It is not only grassroots communities, researchers, engineers, and civil society organisations that make efforts to bring internet access to all. Facebook is trying to provide basic internet connectivity everywhere in the world for free, and competes with Google over “stratospheric internet plans”. Such platforms have the power to become the only online places that people visit, at a huge price: our privacy and self-determination. So, a very challenging question is raised for community networking activists: to which internet are they helping people to connect? And why should their offers be chosen over more mainstream, easily accessible, ones? The answer to these questions reveal a tension between the immediate need to provide access for all and the need to make sure that the internet is built for the common good and not the interests of a few global corporations. Building local alternatives can play a key role in creating necessary net-diversity and serve many important practical, political, and social purposes. This is the first of two articles on the phenomenon of DIY internet. Vasilis (Billy) Niaros is a Research Fellow at the Urban Transformation and Global Change Laboratory (TURBA) of Universitat Oberta de Catalunya. He is also a Core Member of the P2P Lab and a Member of the P2P Foundation. His research work is related to commons transitions at the city level with an emphasis on makerspaces and the use of local manufacturing technologies. Community Wealth Building and the Preston Model: Call for Contributors. Marco Fioretti on From Platform Cooperativism to Protocol Cooperativism?